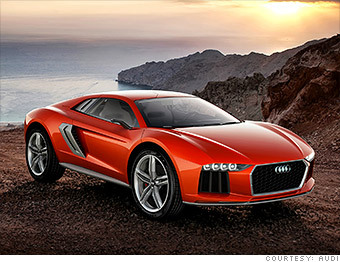 Audi claims this sporty crossover concept can get from zero to over 60 miles an hour in just 3.8 seconds and that should get about 30 miles to a gallon. This is thanks, in large part, to an efficient 5.0-liter diesel V10 engine that puts out 544 horsepower and an impressive 738 foot-pounds of torque. As with cars from Audi's sister brand, Lamborghini, the engine is visible under a glass cover.